This project began as an uncompleted model I inherited from Richard Hendrickson. 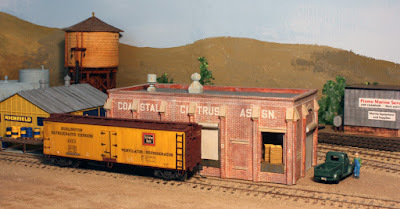 He had stripped off the molded-on grab irons and ladders from the Accurail car body, along with removing the B-end brake gear, and all sill steps. He had built up most of the underbody brake gear. 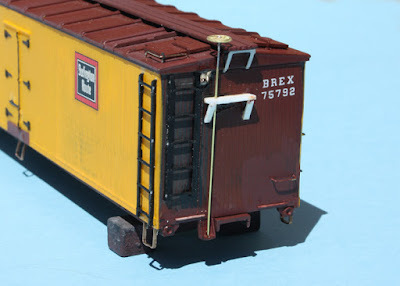 I showed prototype photos of a BREX car, as well as the original state of the model, in my first post on this topic (see it at: http://modelingthesp.blogspot.com/2016/07/upgrading-accurail-brex-reefer.html . In my second post, I showed the first of the additions I made to the car, including wire grab irons, InterMountain ladders, and A-Line sill steps, along with a new styrene brake step. That post is available at this link: http://modelingthesp.blogspot.com/2017/07/upgrading-accurail-reefer-part-2.html . My next step was to add the rest of the details for the B or brake end of the car. I used a retainer valve from a Tichy brake set and added 0.010-inch styrene rod as the retainer line. I used a brass Precision Scale brake wheel, which I soldered to 0.015-inch brass wire. This makes a durable version of this kind of brake wheel. The stirrup for the staff at the bottom of the car body was drilled to accept the wire, as was the brake step, and the brake staff was attached with CA. Lastly, scale 1 x 3-inch styrene strip was used for brake step braces. Next step was to paint all the remaining parts as needed, mostly boxcar red on the car ends, along with some touch-up elsewhere. Then I was ready to complete the lettering with decals. I had the remnants of a decal set, I think from Speedwitch Media, but had used part and cut off the top identifier, so am not sure. In any case, Speedwitch makes two different, excellent decal sets for WFEX / FGEX which include the parts I used, most visibly the ‘ventilator – refrigerator” lettering. (You can see the Speedwitch decal list here: http://speedwitchmedia.com/decals/ .) The photo below shows the model with all lettering added. You can see I have installed Kadee #58 couplers. Because I dislike the Accurail friction-pin design of the coupler box, I simply tap the hole in the coupler box post, then make a new box cover from 0.030-inch sheet styrene, which can be screwed on with a 2-56 screw. This accomplishes solid installation and also easy future access. To compare the photo above to the prototype, see the photo in the first post in this series (link provided in the first paragraph of the present post). In that regard, I should repeat a comment from that first post, that this project only parallels a recent Accurail upgrade by Mont Switzer in some ways. 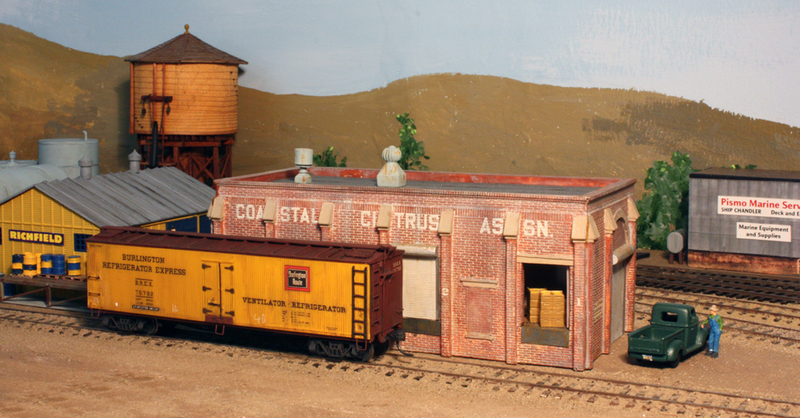 His project was described in Model Railroader magazine (the issue for August 2016, page 36). The primary difference is that Richard and I had an objective different than Mont’s, in that we wanted to backdate the car to a prior era (originally, for Richard’s modeling time of October 1947). The most visible difference of the two eras is the lettering, along with the black side hardware. This photo shows the reefer spotted at the Coastal Citrus warehouse in my layout town of Santa Rosalia. You can see field boxes of lemons in the open doorway (you can click to enlarge). With completion of this project, I am pleased to have finished something I hope Richard Hendrickson would have liked, and largely to his standards. It will join the other “foreign” reefers in my roster, which, like the prototypes, supplement the PFE fleet in the busiest harvest season (August to October).